I’m moving to London! Some fun career times ahead, but that means that I’ll be spending less time at the workshop than I’d like. So, after doing some internet research, I learned that I won’t be living too far from the South London Makerspace – which is awesome! They’ve got things like lathes, a mill, a laser cutter, etc…. which means that I’ll be able to make robots in the evenings! But all of this won’t matter if there’s nothing to make. Toecutter was/is a great design exercise, but something for later on down the line. No. I need a design that works in both the Extreme Robots and Robots Live arenas. Something that I can make spares for quickly, a simple yet huggable design… The Hug Machine. It’s not Boing! and it’s relatively simple, but that means I can make it with basic tools and combat-proven parts. The Hug Machine is cutesy yet powerful, and the wedge will probably break. – 10:1 Reduction for a 55MPH head speed. You may ask – why build two featherweight hammers? Boing! is past the design phase, why build another? Because The Hug Machine isn’t supposed to win. 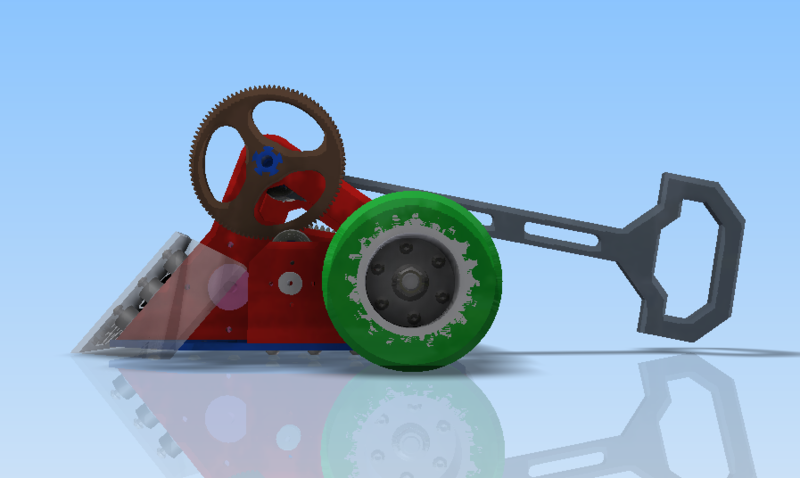 It’s supposed to go out there and be the reliable bot that makes a lot of noise and can actually drive around quickly. In essence, it’s a wedge bot with a swinging thing on the top. Yes, the hammer system is the primary weight sink, and yes, that makes it heavy. But it’s for me to practice my driving with a robot that I know will just……work. The drive system is separate – 4 bolts gets it out – and can be hot swapped at events for different configurations, power, tread material etc. The Hug Machine is a test bot. The build schedule is pretty tight, aiming to get it swinging by April 21st. The buying list is fairly packed, but I’m hoping to get some rough platform together soon.